Review | Drum roles at Kia! There's an all-new Rio! But is that such great news? Until now the Rio was no more than an average looking, cheap family car of which only the name was exciting. The new Rio is supposed to be differen. According to Kia it is exciting both to look at and to drive. Is this the first cool Kia Rio? Whether or not the Rio looks good is easy to establish: take a look at the photos. But don't judge just yet! While the car in the brochure is always the top spec model with the most desirable options, the version on the pictures here is the absolute base model. Most testing was done with the super frugal "1.1 CRDi". To improve fuel efficiency, weight was saved and so this version has to do without fat alloy wheels, chrome trimmings, fog lights or blinkers in the mirrors. This isn't even the sporty looking three door, but the rather square five door. On top of that the test car is executed in the most unflattering colour possible: white. As far as Autozine is concerned the Rio still looks great and that is a huge compliment to the designers! The Rio owes its self-assured looks to the relation between height and width. 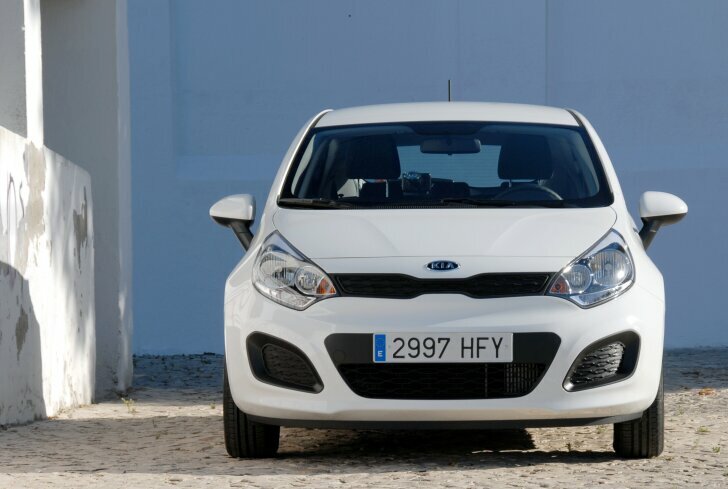 Compared to the previous Rio this fourth generation is lower and wider, giving it a robust stance. Despite this, headroom has increased. Both in the front and rear the Rio offers above average space for a car in this segment. The front headrests can be adjusted so much that they actually offer a serious contribution to safety for tall drivers. The boot measures a decent 288 litres (expandable to 923 litres), but is plagued by a high threshold which makes loading and unloading more difficult. 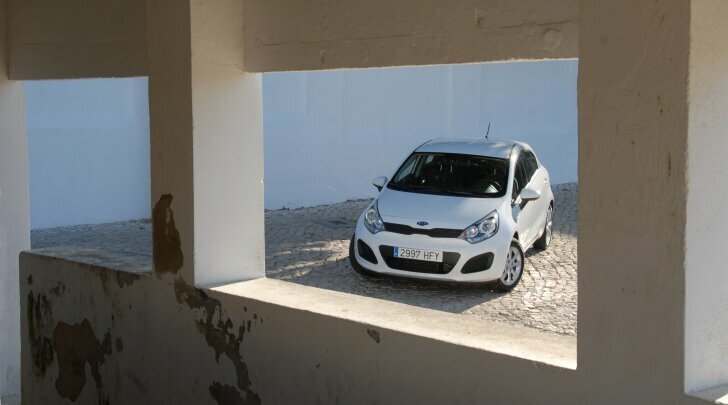 With the right options, the Rio can be a serious alternative to a company car from a higher segment of the market. For example: dual zone climate control, a heated steering wheel, a rear-view camera, keyless entry and satnav are all available. A feature worth mentioning is the integration of the heater and seat heating; by connecting both systems energy can be saved, because the cabin seems to reach the set temperature quicker. An automatic defogger uses a sensor that measures cabin temperature and humidity to always ensure a clear view. As to audio and navigation, Kia receives a good grade as well, but on this aspect the brand is less innovative than its competition. For example, it is not possible to install "apps" or other extentions. The sound quality of the "high grade" audio system is fair, but not half as crisp as the brochure leads one to believe. The iPod interface works flawlessly. As stated before, most test-driving was done with the "1.1 CRDi ECOdynamics". CO2 emissions of this extremely economic version are just 85 grams per kilometer, 2 grams less than the previous record holder. 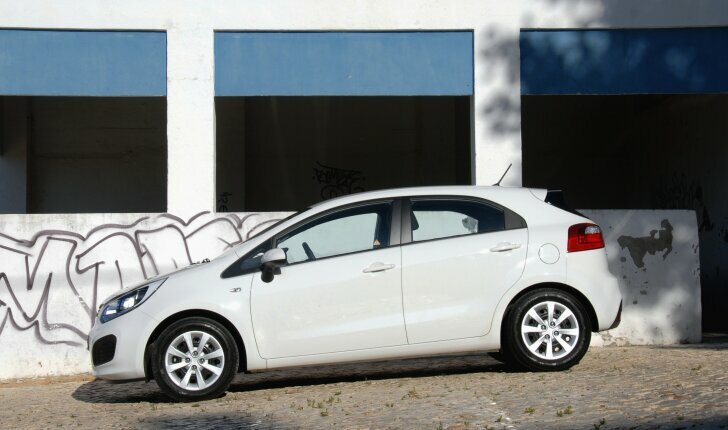 And that's not all: the "Rio 1.1 CRDi" is the best small diesel engine available right now! Literally in all aspects, the Kia does better than its rivals: this green Rio performs so well, that the driver never feels like they are driving an eco car. The three-cylinder engine develops 75 PS / 170 Nm, yet the characteristic and often disturbing three-cylinder noise is almost absent. The biggest advantage is that the promised fuel economy of 3.2 litres per 100 km (88 mpg) can actually be realised. Even without trying, the trip computer showed an average of 3.9 litres (72 mpg) on a very demanding route with mostly mountains and city traffic. Driving high speeds on long distances hardly affected this figure. The test car did develop a problem with the stop/start system, which refused to start after stopping on three ocassions. According to Kia this was because the test drive was done with a pre-production vehicle. The petrol cars tried later did stop and start without any hitches. Those opting for a petrol engine have the choice of a 1.2 or 1.4 litre four-cylinder. The lightest of the two performs adequately, but clearly lacks the muscles when a little extra power is required. For example: when driving with four people and their luggage, the driver regularly needs to press the pedal to the metal just to keep up with traffic. Climbing a steep slope also demands the utmost from the 85 PS / 121 Nm strong base engine. 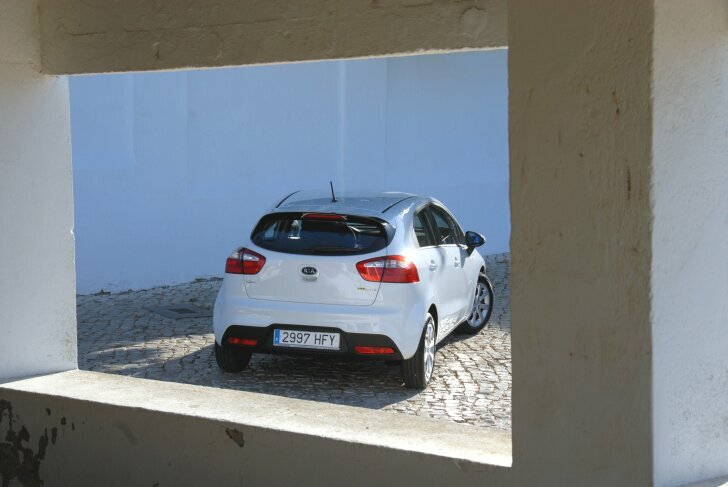 Kia promises the Rio 1.2 has an average fuel economy of 4.8 litres per 100 km (59 mpg). Because the power train needs to work so hard, this can only be achieved when driving so slowly that the Rio slows down traffic. Once at cruising speed, the "Rio 1.2 CVVT" is remarkably quiet. That is pleasant on long distances, but also emphasises the feeling of driving an underpowered car. When going flat out, nothing happens and nothing can be heard either. As an alternative a 1.4 litre engine is available and it has noticeably more punch (109 PS / 137 Nm). However, performance is still not nearly as good as with other cars with a similar engine under the bonnet. Because the "1.4 CVVT" doesn't have to work quite so hard, this engine is fuel efficient. Even on a route with mainly city traffic the trip computer showed an average of 6.5 litres per 100 km (43 mpg). Despite the chosen power train, the Rio has excellent handling. The suspension (shared with the "i20" from Hyundai) isn't too soft or too firm, but just as the European driver prefers. Handling can be summarised as safe and predictable. In case the driver underestimates a corner, the car is easy to correct (an electronic stability programme comes as standard on every Rio). This may not be exciting, but it does make sure the driver always keeps his cool. 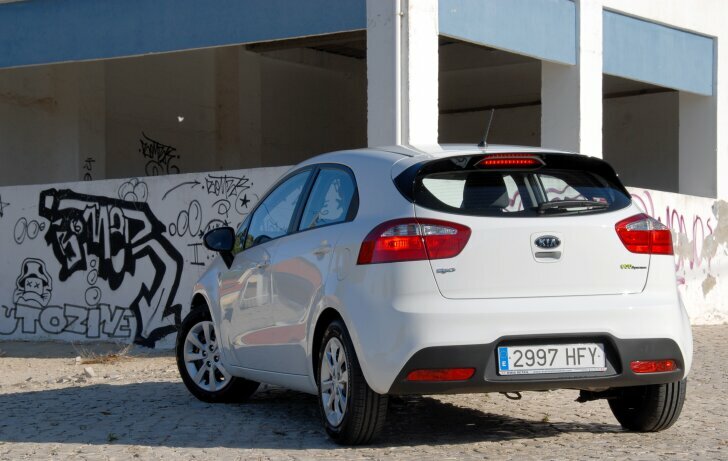 Is the introduction of a new Kia Rio really reason for excitement? Yes, without a doubt! 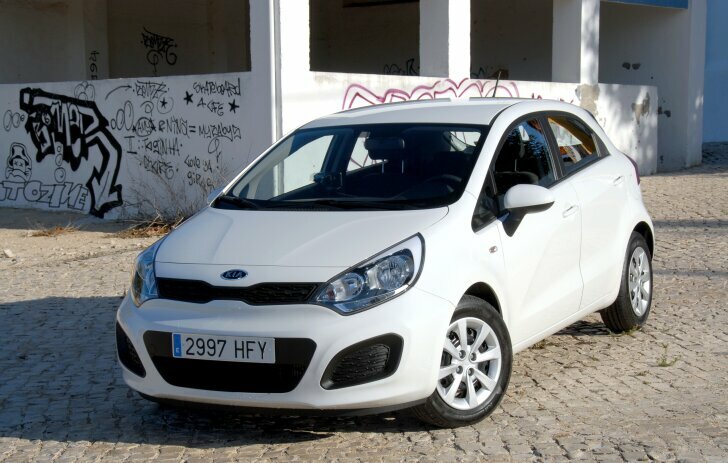 After several rather bland looking predecessors the new Kia Rio is actually "cool" and even desirable. When it comes to design, spaciousness and build quality, the Rio scores far above average. Handling is good, but not exciting. All engines are frugal. The petrol engines perform poorly, while the 1.1 litre diesel is the best engine in its class (more quiet, more powerful, more economic). This means there's a world of difference between the previous generations and this new Rio, which is finally "cool".